The roots of the Rafaellesco, a classic majolica pattern from the Umbrian city of Deruta, can be traced back to the famous Renaissance artist Raffaello Sanzio. The borders of his frescoes were often decorated with symbolic decorations depicting dragons and mythical animals. During late 16th century Italian ceramicists adapted the stylized designs from Raphael’s frescoes, giving rise to a pattern that is still popular today. The benevolent dragons can be found on tiles, plates, bowls, platters, vases and cups with puffs of wind steaming from their mouths, granting good luck and fair winds to the seagoing merchants of the time. Over 200 ceramic (ceramiche) workshops and shops are located in and around Deruta and throughout the area you can find chapels, palazzos and basilicas decorated with these exquisite hand painted works of art. One of the most notable is the sacristy of the Basilica of San Pietro in Perugia with the remains of a pavement made from Deruta tiles. Today travelers to Deruta can still browse the cobble-stoned streets to find a piece of majolica to begin or add to their collection. 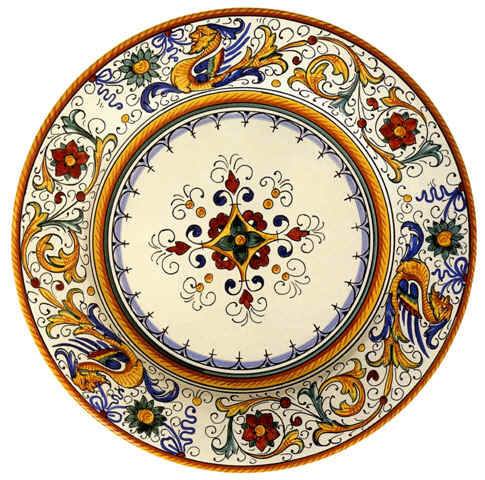 My choice – hand painted espresso cups and biscotti jars although I seriously covet large ceramic wall plates, astonishing statements of color and art that often tell a story (istoriato) or celebrate an occasion (piatti da pompa) and are as evocative as a Renaissance fresco . The tablescapes of the Italian tavola can be as rustic as a rural casa colonica or a refined as a Renaissance villa. 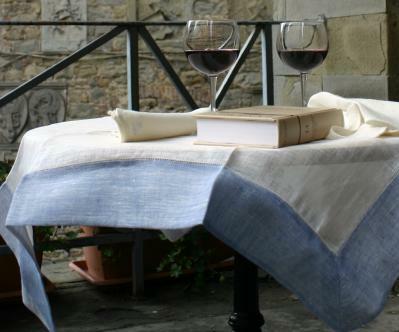 Known for both functionality and beauty the evocative colors of Umbrian linens reflect the beauty of the Italian landscape, the allure of ancient patterns and the skill of the weaver. 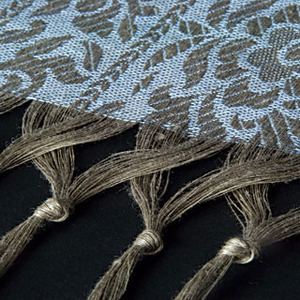 The palette of colors used to create the designs are symbols of the cultural life of Umbria. Green for the olive groves, pink and cream the colors of the stones of the cities, garnet symbolizes the local wines, Montefalco Rosso and Sagrantino; russet, yellow and marrone, the fields of wheat and tobacco and cielo, the color of the blue sky. The designs themselves are classic patterns from the Middle Ages and Renaissance; scrolls, leaves, flowers, amphora jugs. Ornate and stylized patters and mythological characters like the griffin (symbol of Perugia, the capital of the region) were influenced by eastern designs from China when 17th century Italian potters began copying Chinese ceramics. 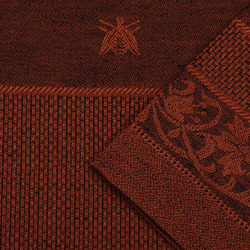 The api pattern (bee in Italian), said to bring luck and good fortune, was a symbol of Cardinal Maffeo Barberini (later elected as Pope Urban VIII) who had been the Bishop of Spoleto from 1608-17. Three bees were his coat of arms and can be followed all the way to Rome. Bruce Feiler, a popular American author writing about finding happiness and meaning in everyday life, found that when a team of psychologists measured children’s resilience, kids who knew the most about their family’s history were best able to handle stress. Rediscovering our family history in Italy began well before my first trip in 1999 to visit our cousins in Milan. Our Nonna left Italy in 1919 and like many Italian immigrants circumstances of time and place, marriage and family caused her to travel to the United States with her husband. But her heart was still in the Veneto and the oral traditions of her life in Italy were kept alive through wars and liberations, births and deaths with letters and pictures, money and presents exchanged creating a family bond that would take me on a series of trips to see and savor an Italy of family and friends that have enriched my life in ways I could never have imagined. I encourage you to discover and curate your family’s history here and if possible abroad. The importance of developing an “intergenerational self” will create a legacy of self-worth that your children, grandchildren and extended family members will benefit from in ways you cannot imagine. 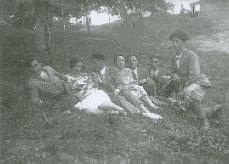 The spirit of family with stories of personalities from the past and a shared sense of tradition is worth finding. The 21st century has been called the age of post- familialism where family treasures are more often found on e-bay than handed down and thoughtfully cared for. Whether through places, people, objects or the generational recipes of our grandparents, the pleasure of the family is a lost art that must once again be found. 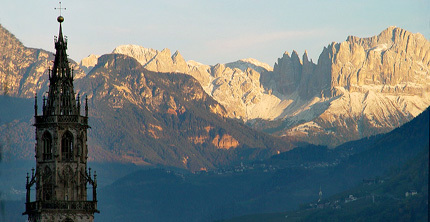 Traveling in the Trentino -Alto Adige region of Northern Italy, also known as the SudTirol, begins with an Italian opera and ends with a Swiss yodel. The alpine valleys, snow-capped mountains, chalets and ski resorts will make you re-think Italy and re-invent your palate when it comes to Italian food. A trip through the region will likely find you feeling like Dorothy in the Italian Land of Oz saying “I don’t think we’re in Italy anymore”. The southern half of the region (Trentino) is ethnically Italian, the northern half (Alto Adige, or SüdTirol) is ethnically Germanic and the entire region was once part of the Austro-Hungarian Empire until Italy annexed it at the end of WWI. Although you are in Italy, because of geographic boundaries and historical alliances, Italy’s South Tyrol is a melting pot of flavors, food customs and languages. As you cross the border you begin to see not only a change in the scenery but a change in the language. The official languages of the area are German and Italian however there is a third spoken language called Ladin. Ladin is a Romanized version of the Germanic dialects that were once spoken here and today the language clings to existence with fewer than 100,000 speakers left. It is not uncommon to see menus written in German and Italian, or local sights identified in all three languages. Road signs have to be bi-lingual (tri-lingual where Ladin is spoken) and normally the first name identifies the majority population in the area. In the Ladin language, Ben uni means benvenuti and streda means strada and if you are looking for a plate of gnocchi try the tirolese dumplings or canederli aka Tiroler Knodel along with the stinco, wurtzel and some awesome German beer. The ancient Italian custom of Carnevale has begun and the traditional Lenten fast that begins on Ash Wednesday is a few days away. The word “carne vale” in Latin means “meat farewell” and 40 days of meatless Fridays can be a challenge. So what’s a carnivore to do? Channel your inner Italian for dishes inspired by the culinary and cultural history of Northern Italy influenced by the food traditions of the SudTirol, a mere yodel away from Switzerland. The southern half of the region (Trentino) is ethnically Italian, the northern half (Alto Adige, or SüdTirol) is ethnically Germanic and the entire region was once part of the Austro-Hungarian Empire until Italy annexed it at the end of World War I. Although you are in Italy, the geographic boundaries and historical alliances of the region make the South Tyrol a melting pot with a distinctive mixture of flavors and food customs. 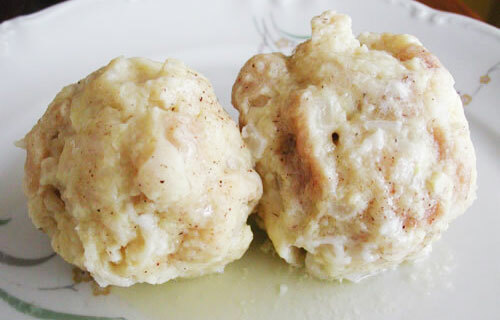 One unique specialty of Tirol cuisine are canederli, large round dumplings (similar to gnocchi) that are found on just about every table in the Trentino-Alto Adige. With a cuisine influenced by neighboring Germany, Switzerland and Austria, where they are known as Knödel, these little bread balls are often flavored with speck (a regional aromatic cured meat, similar to prosciutto, flavored with juniper, laurel and rosemary). You can make them a meatless meal by using spinach, mushrooms, sauerkraut, cheese, herbs or beets (canederli di barbabietola served with a tangy horseradish sauce like they do in the Dolomites near Bolzano). 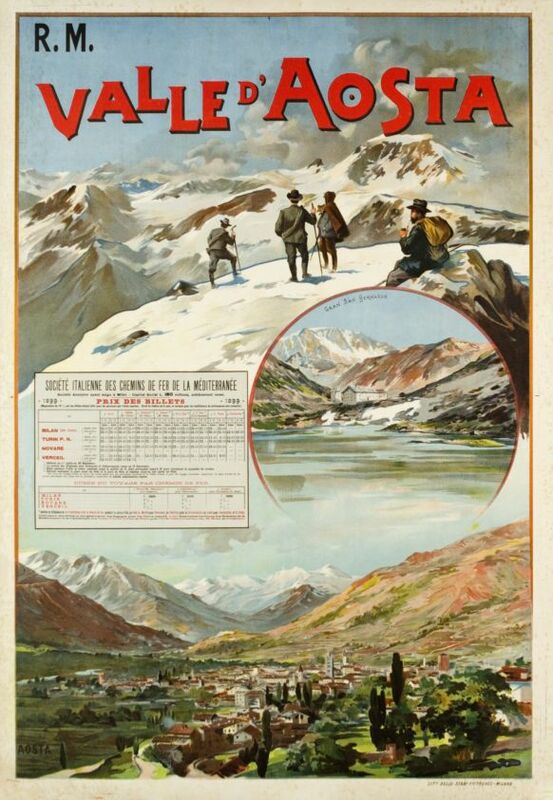 Another region of Italy a mere yodel away from Switzerland is the Aosta Valley in northwest Italy that borders Switzerland and France. For a memorable meatless Friday melt into a Valdostana fondue . A recipe from the Italian Alps that has its origins in the traditional Swiss fondue, but it differs in the presence of egg yolks, instead of wine or liquor. Should you need to make this alpine fondue even less penitential add a glass of Italian Sauvignon Blanc. Slice the cheese and place it in a container to rest overnight, covered with some milk. When preparing fondue, melt the cheese soaked in milk in double boiler (not allowing the water to boil) with beaten egg yolks. Stir continuously with a wooden spoon until you have obtained a thick cream. Serve the fondue in terracotta bowls with slices of toasted bread. Alternatively, you can use the typical fondue pot with its heater at the table, and allow each diner to dip pieces of toasted bread into the pot using long stem forks. 30 minutes preparation + 20 minutes cooking. One taste of a well-prepared tiramisu or pasta fatto a mano and you know that Italian food is heavenly. But did you know there is one Italian ingredient that assures you of “divine intervention”? 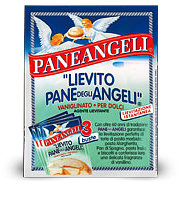 You can bake with a little help from the angels to create a slice of heaven with Lievto Pane degli Angeli a special Italian yeast with a hint of vanilla. Made by a Paneangeli, a company who has 81 years of experience making yeast breads and cakes, gave birth to the legend of this heavenly ingredient. The company readily admits that as often happens “with things and events of magic taste” the reality may confuse fact with fiction. The legend goes that in his first grocery store, Signore Ettore Riccardi, the founder of Panangeli, prepared and sold a loose powder to leaven cakes; a special formulation characterized by a vanilla aroma with a scent that perfumed the entire house and even the wardrobe. A customer after purchasing a sachet of his leavening powder was so impressed by the success of her cake she exclaimed that the cake was so light and fluffy that it was made by angels. The idea of being touched by an angel was used in one of the company’s early advertising campaigns when the 6-year-old son of the founder of the company devilishly breaks dishes with a hammer, but after eating a slice of cake made with the “Bread of Angels” becomes very good, even angelic. Today the company makes a variety of products including flavorings and leavening agents for pizza obtained from fresh beer. They also have a prepared mix to help you create your own Torta degli Angeli and have authored several cookbooks including one for Carnevale and an annual calendar with recipes using their products that looks, dare I say, heavenly. Casanova’s Venice, Juliet’s Verona, the romance of Bellagio and Italy’s Lake District. The seaside villages along the Italian Riviera, the scent of chocolate in Perugia, lemons in Amalfi and the fragrant flowers of Capri. The eternal allure of Rome and the breath taking beauty of the art and architecture of Florence. All have made Italy one of the Top Ten Romantic Destinations in the World. The land of Italy is a land of romance, a land whose people have an ardent emotional attachment to the history and traditions of their country. 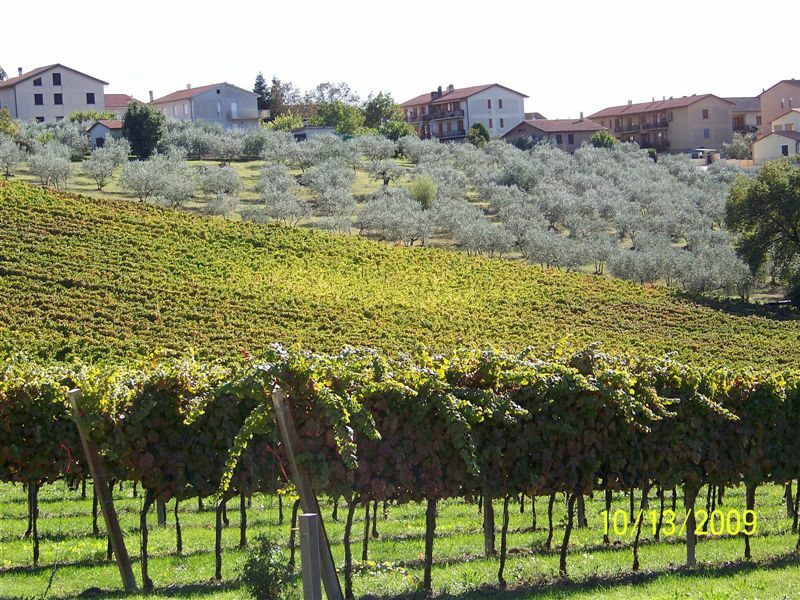 The food, wine, art and design of Italy are all made with love. It’s easy to find your bliss there. Two of our favorite romantic places in Italy are off the tourist flow but well worth the effort to discover. Palazzo Ducale (Ducal Palace) has been described as 500 rooms of Renaissance glory where the renowned court of the Gonzaga ruled the city of Mantova for over 300 years. A vast complex of buildings with palaces, courtyards, hanging gardens and painted rooms evocatively named the Zodiac Room, Hall of Mirrors, Apartment of Paradise, River Chamber and Apartment of Troy. 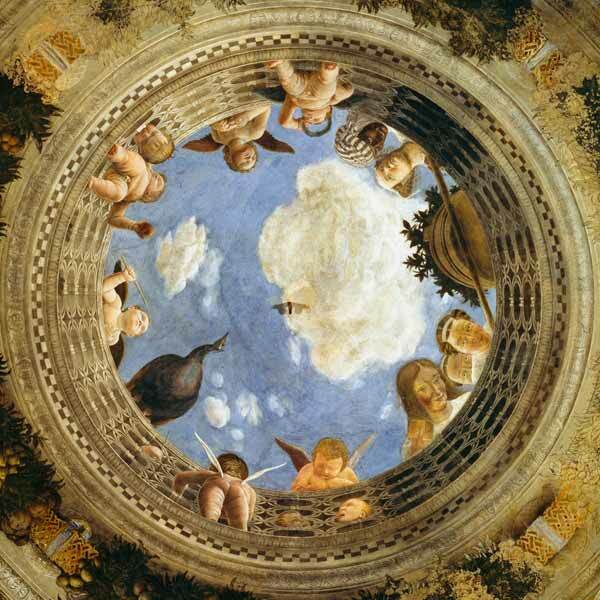 Perhaps the most dramatic of all is the Camera degli Sposi (Wedding Chamber) also known as the camera picta with a ceiling fresco painted by Andrea Mantegna as a doomed oculus that is almost beyond imagination. Opening on to a painted blue clouded sky, assorted characters are part of a trompe l’oeil scene looking down into the room with curiosity and amusement while winged putti (cherubs) playfully cling to a balustrade, on the brink of falling into the room. The oculus remains a classic illusionist masterpiece and the 15th century frescoes in Palazzo Ducale’s Camera degli Sposi are mentioned on Forbes 10 Things to Do Before You Die list and 100 Places Every Woman Should Go. I would prefer to include it on 10 Things to Do to Make You Feel Alive and One of the Most Romantic Places in Italy. Due to the earthquakes of May 2012, a visit to the Palazzo Ducale has been modified. The Wedding Room will be closed until at least September of 2013. The Brenta Riviera (Rivera del Brenta ) is a scenic strand of coastline along the Brenta River that links Venice to Padua. Favored by Casanova and Byron, architects such as Palladio designed summer residences (villas) along the river for wealthy Venetians who were looking for a diversion from the summer heat. They would take “designer” barges known as a burchielli floating along the Brenta Canal (naviglio Brenta), stopping along the way to party. 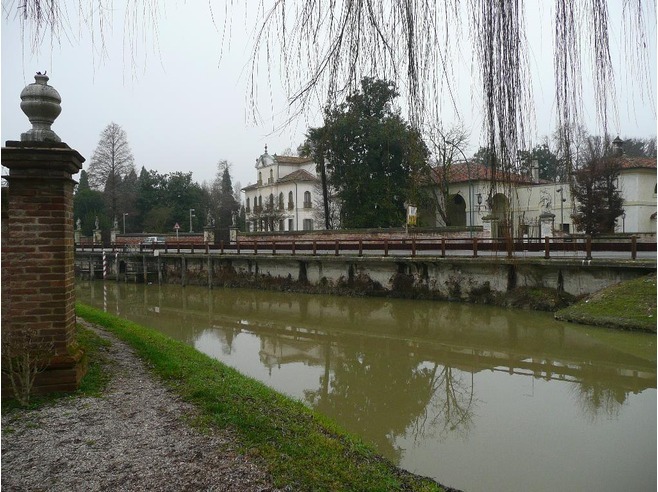 One can only imagine the trip along the Brenta among the wheeping willows, as the life of the canal revealed itself to you with magnificent villas, craftsmen’s workshops and fisherman along the banks of the river. And in the burchielli of the wealthy Venetians, noblemen entertaining their guests with comedians and musicians, slowly floating down the river in colorful, elegant barges decorated with mirrors and carvings traveling to their country villas. The 18th century Venetian playwright Carlo Goldoni describing the villa season wrote “Tis time to set out for the villa. O’ longed for moment come at last. What anguish we’ve endured fearing we should never go“. Now that’s romantic. It is possible to follow the historical route of the Venetian burchielli, viewing the villas along the way. There are replicas of burchielli and motor barges navigating the Brenta from Padua to Venice that can be rented but you can also drive route S11 that runs along most of the canals length. We did this with my Italian cousins and stopped at Trattoria Porto Menai dall’ Antonia along the canal in a town called Mira for a spectacular feast of scampi giganti griglia (giant shrimp, grilled) and other assorted seafood with prosecco to drink. What Happens in Venice Stays in Venice? You might think I’m talking about the pursuits of the masqued Venetian party-goers of Carnevale but what I’m referring to is indulging my uncontrollable desire for Venetian pastries. Frittelle, zaletti (Venetian cornmeal diamonds) tiramisu and decadent tortas, where does it end? If you happen to be in Venice, never; Venice a city where sugar seems to be in the air. The seemingly endless Venetian pastry shops (pasticcerria) that line the narrow streets and spill out into each campo from the Dorsoduro to San Polo tempt you with all manner of confectionary delights. 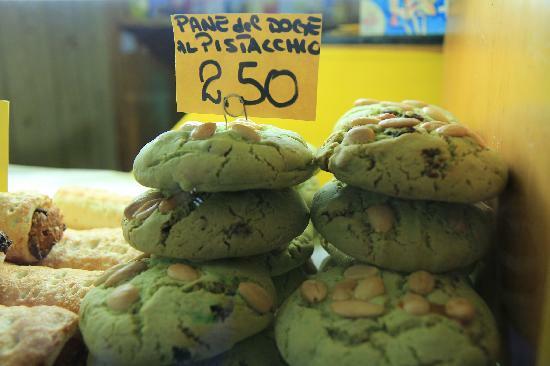 are the Doge’s Cookies (Pan dei Doge). Being partial to Doges in general (see my blog on Descended from the Doge) these cookies are amazingly good. I am enamored of the pistachio version and if that weren’t enough to tempt my latent sweet tooth there is the exotic and elegant Torta del Doge, a small buttery cake filled with raisins topped with pine nuts and flavored with rum and I haven’t even mentioned the zabaglione cream puffs.